A royal visit is a big boost to any city and Nottingham is no exception. The forthcoming visit of Prince John has swelled the city’s population and thus the size of the potential purses to spend at the city’s market. With the increased demand for goods, merchants from far and wide have an opportunity to make big profits by shipping goods in, or really making big profits by smuggling illegal goods in! 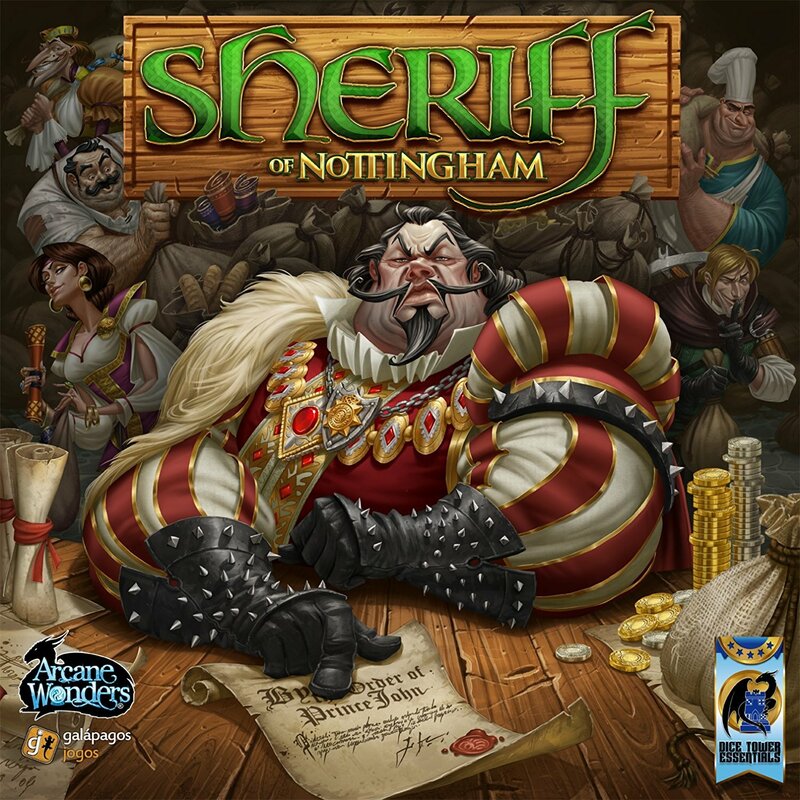 Unfortunately, the Sheriff of Nottingham wants to be seen to be doing his job—and that includes inspecting all of the goods coming into his city. If a merchant is found to be smuggling, then the Sheriff will definitely fine him and confiscate the smuggled goods, that is, unless the merchant bribes the Sheriff first! This is the set-up for Sheriff of Nottingham, a game published by Arcane Wonders. It is a game of bluff, deduction, and trickery in which the players take turns being the Sheriff whilst the others are merchants shipping their goods past the Sheriff. Each turn a player fills a sack with goods and then declares how many and the type of goods that he has in a sack. The Sheriff can only guess at what might be in the sack. He has the right to inspect every sack for illegal goods. If he discovers any, the merchant is fined; if none are found, then the Sheriff must compensate the merchant! Winner of the 2015 Origins Award for Best Board Game, Sheriff of Nottingham is designed for three to five players, aged thirteen and up. It primarily consists of two-hundred-and-sixteen goods cards, most of which are green and represent legal goods—apples, cheese, bread, and chicken. The rest are red and represent illegal goods—pepper, mead, silk, and crossbows! In addition, there are Royal Goods—they are illegal and marked with a banner and worth extra if a merchant successfully smuggles them past the Sheriff. The Royal Goods are an extra option not used in the base game. Each goods card is marked with two numbers, one that represents the reward gained at game’s end if it gets to a merchant’s Stand, the other being the fine paid if the goods card is confiscated or the Sheriff inspects legitimate goods. Besides the cards, there are over a hundred coins in various denominations, five Merchant Stand and Merchant Bags in matching colours, the Sheriff marker, and the rulebook. Each Stand illustrates a player’s merchant as well as giving the game order and a place to store successfully shipped goods. the Sheriff marker is used to indicate which player is currently the Sheriff. All of the components are of a nice quality. The cards look good and feel good in the hand; the money and Stand are of thick card; and the rule book is clearly written. The artwork is excellent, especially the illustrations of the Sheriff and the merchants. A nice touch is that the inner tray holding the game’s components can be taken out of the box and used to arrange them during play. At game’s start, each player receives fifty gold and six Goods cards as well as a matching Merchant Stand and Merchant Bag. Once the cards have been thoroughly shuffled—and they do need a good shuffle—two discard piles of face-up cards are formed of five Goods each are formed either side of the deck. One player is the starting Sheriff. Each turn consists of five Phases—Market, Load Merchant Bag, Declaration, Inspection, and End of the Round. All of the players must complete a Phase before moving onto the next and the Sheriff is only involved the last three Phases. In the Market Phase, the players can discard up to five Goods and then draw back up to six. These new Goods can be drawn from the draw pile or either discard pile. Drawing from a discard pile means that a player will have some idea as to what he might draw, but it also gives the Sheriff a hint as to what a merchant has in his hand. In the Load Merchant Bag, a merchant loads his Merchant Bag with between one and five Goods, then snaps the bag closed. These are the Goods that a merchant wants to take to market. In the Declaration Phase, a merchant states aloud what is in his bag, but can only say the contents consist of Legal Goods, one type of Goods, and how many. For example, “My bag contains three Apples.” This of course could be true, but it might also be a lie. Instead the bag might contain illegal Goods or legal Goods different to those declared. In the Inspection Phase, the Sheriff is free to open any or all of the merchants’ bags. Before that happens though, the Sheriff is free to demur and the merchants are free to bribe the Sheriff. They can offer him money or Goods from their Stands or their Merchant’s Bag—be they legal or illegal. They can persuade him to open the bag of another Merchant. The Sheriff is free to accept these bribes, negotiate for more, but once he opens a bag or hands it back to its merchant, then no more bribes can be made. The results are final. In the End of the Round Phase, fines are paid if illegal Goods have been found or legal Goods unnecessarily inspected. Then the role of Sheriff passes to next player and another turn begins. This continues until each player has been Sheriff twice—or three times in a three-player game—and everyone totals up their money and the value of the Goods they successfully shipped. The two players who shipped the most of a Good are crowned the King and Queen of Cheese (or Apples or Bread or…) and score bonus Gold. The merchant with the most money is the winner. Sheriff of Nottingham is not though, a board game. Its emphasis on social interaction—negotiation, bribery, and bluff—make it a party game. The quality of the cards and the fun of snapping the bags open also give the game a pleasing physicality. Its easy rules and engaging theme also make it an easy game to introduce to and play with non-gamers. This also means that its replay value is not as high and much of the game’s fun depends on who you play with and the game is not as satisfying to play with three players as it is with four or five. Another issue is that game can be won by playing it entirely safe, by not having to smuggle goods past the Sheriff or indeed, bribing the Sheriff and this runs counter to the point of the game. This can be a bit disappointing even as you are bluffing the Sheriff into believing that you cannot be smuggling illegal or mixed goods and forcing him to check your bag and take the consequences. If you are looking for a well designed, fun party game, then Sheriff of Nottingham is a good choice. It is satisfyingly simple and engaging, perfectly suited to the non-gamer and the gamer looking for a lighter diversion.